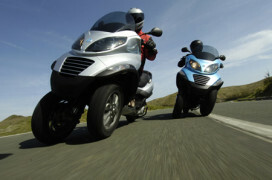 Piaggio MP3: Three Better than Two? ROME, Italy – Piaggio’s revolutionary three-wheeler, the MP3 is around the corner, as deliveries are due in August.The Piaggio MP3’s twin front wheels are married to an electro-hydraulic suspension locking system that holds it bolt upright at standstill. ROME, Italy – Piaggio’s revolutionary three-wheeler, the MP3 is around the corner, as deliveries are due in August.The Piaggio MP3’s twin front wheels are married to an electro-hydraulic suspension locking system that holds it bolt upright at standstill. When the throttle is opened it deactivates automatically and the machine is free to lean into corners like a proper motorcycle. Putting twice as much rubber on the ground at the front end also enhances braking. Piaggio claims stopping distances 20% shorter than the best conventional scooters. The third wheel is not this machine’s only peculiarity. Piaggio describes the front end as incorporating "car-style bodywork". Project manager Nicola Poggio says: "The first objective is to improve safety. We have made a scooter that can appeal to commuters who are scared of conventional two-wheelers."